On the Russia investigation and the “deep state,” no one has a greater influence on the president than the Fox News host. Even at a network that more or less drafts Trump’s talking points, Pirro stands out for her influence. As Fox’s loudest voice on legal matters and a personal friend of Trump, she shapes his views on the defining issues of his presidency: the investigations into his inner circle, campaign collusion with Russia, and obstruction. 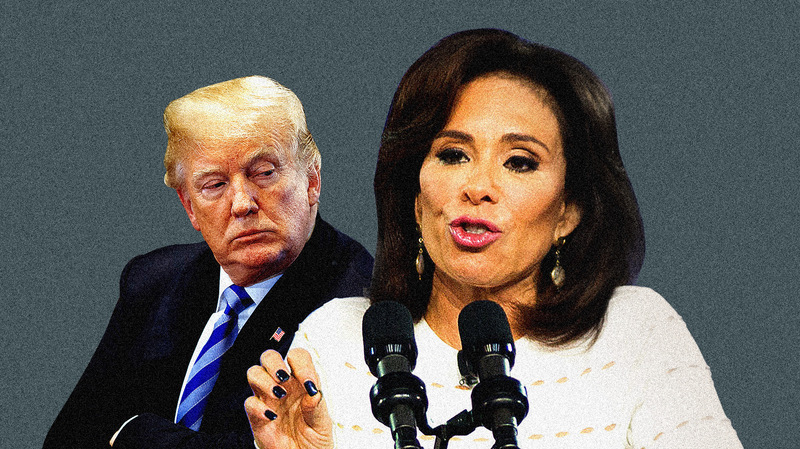 Pirro’s message to Trump on her show is consistent: Ditch Attorney General Jeff Sessions, whom she deems an inadequate defender of the president for recusing himself from the Russia investigation, and sic the Justice Department on Hillary Clinton. Last fall, Trump welcomed her to the Oval Office, where she made the same pitch in person. Two days later, Trump upped his pressure on the Justice Department to investigate his political rivals. “Everybody is asking why the Justice Department (and FBI) isn’t looking into all of the dishonesty going on with Crooked Hillary & the Dems,” he tweeted. Ten days after that, the department announced it was revisiting dormant investigations into several of Clinton’s alleged crimes. The influence of Pirro and other Fox hosts has sometimes left White House staffers scrambling to control the damage. Trump’s aides have reportedly had to put out fires that Pirro lights; during her Oval Office meeting with the president last fall, Trump’s chief of staff, John Kelly, told Pirro that she wasn’t “helping things.” (Meanwhile, other top White House officials deliberately pushed Trump to spend more time watching Fox because he was growing so agitated by what he saw on CNN and MSNBC, New York magazine reported.) The White House press team appears to have incorporated Pirro’s show into its communications strategy, regularly dispatching spokespeople to appear on the show—partly because Trump is watching, according to the Washington Post, and partly to prevent the president from calling in himself, as he did earlier this year. Trump has also granted Pirro several exclusive interviews. As Fox’s loudest voice on legal matters and a personal friend of Trump, Pirro shapes his views on the defining issues of his presidency. Prior to Trump’s unlikely 2016 victory, the 66-year-old Pirro seemed destined to languish in the backwater of Saturday-night cable TV. A onetime elected judge and prosecutor in New York state, she saw her political career fizzle in a string of humiliating defeats. She ended her 1986 lieutenant governor bid after two days amid questions about the alleged mob ties of her husband, Al, who likewise thwarted a potential US Senate run in 2000 when he was convicted of conspiracy and tax fraud. In 2005, Pirro self-sabotaged, kicking off a challenge to Sen. Hillary Clinton by freezing up for 32 seconds during her rollout speech when a page from her remarks went missing. She ran for state attorney general instead, losing by 20 points as the feds investigated whether, suspecting an affair, she’d illegally bugged her husband’s boat. Pirro denied wrongdoing, and no charges were filed. She eventually landed a daytime Judge Judy-type show on the CW network before moving to her 9 p.m. Saturday Fox show—a historically undesirable time slot with low viewership. But one viewer matters most. Trump and Pirro have been friends since the 1990s, when Al, known as Westchester’s most powerful real estate lawyer, claimed Trump as a client. (The Pirros split a year after the wiretap scandal.) Trump backed Pirro’s district attorney campaign by hosting a masquerade ball fundraiser and donated $20,000 donation to her failed attorney general campaign (though, playing both sides, he gave the same amount to her Democratic opponent). When Trump won his party’s nomination in 2016, Pirro’s show became a 40-minute advertisement for the future president. After the election, he considered her for the deputy attorney general post that ultimately went to Rod Rosenstein. Trump has promoted Pirro’s show on Twitter and sat for comically softball one-on-one interviews. “Mr. President, your approval rating is soaring,” she declared during one such encounter. “And we can talk about the economy and the low unemployment and the stock market and all of the great things that have been happening. To what do you attribute these incredible advances?” She is now working on a book to refute Fire and Fury, reporter Michael Wolff’s chronicle of a White House in chaos. Trump has been interviewed for the book and is encouraging his aides to assist Pirro as well. With resignations and firings decimating Trump’s inner circle, Pirro’s influence is stronger than ever. She’s part of a trio of former law enforcement officials from New York to whom Trump has recently turned. Former mayor Rudy Giuliani is now on Trump’s personal legal team, and former police commissioner and Giuliani acolyte Bernard Kerik, who spent time in prison for tax fraud and lying to White House officials, was spotted this spring at Mar-a-Lago. Coincidentally, it was a federal wiretap of Kerik’s phone that tipped off Manhattan prosecutors to the possibility that Pirro was wiretapping her husband in 2006. Pirro began her career as a prosecutor in New York’s Westchester County in the 1970s and quickly rose to prominence as the head of the district attorney’s domestic violence unit. She was elected to a county judgeship in 1990 and as the district attorney in 1993. She was the first woman to hold either job. Pirro sought out cases that would bring her media attention, Bendish recalls, and after a high-profile murder in her county in 1994 put her in the national spotlight, she became a regular talking head on the OJ Simpson trial. But her headline-grabbing sometimes became dangerous. In 1996, a man named Richard Sacchi killed a cop in Westchester County, then took his own grandmother hostage. As negotiators tried to diffuse the stand-off, Pirro stated on television that she might seek the death penalty for him. If Sacchi had been watching TV inside the house, says Bennett Gershman, a law professor and judicial ethics expert at Pace University, her comments could have prompted him to go out in a blaze of glory. (Unbeknownst to Pirro, he already had. Pirro said her comments were taken out of context.) “It’s so stupid and reckless,” says Gershman, who has lived in Westchester County for decades and followed Pirro’s career. It was part of a pattern of “press conferences where she would engage in unethical conduct by making all sorts of outlandish, inflammatory statements.” Gershman filed an ethics complaint against her for one such press conference years later, though no action was taken. No episode shows Pirro’s hunger for the spotlight like the Robert Durst case. The New York real estate scion was suspected in the disappearance of his wife, Kathie, in 1982, and Pirro reopened the case in 2000 after a tip to a state police investigator. Soon after, Durst was implicated in two more murders, in Los Angeles and Texas, and Pirro crisscrossed the country on Durst’s trail in order, she said, to aid local law enforcement and potentially gather evidence for her own case against Durst. Durst’s lawyers incorporated Pirro into their defense strategy, claiming he had shot his neighbor in Galveston, Texas, in self-defense and then, panicking over Pirro’s incessant hounding of him, dismembered the body and fled the state. One of Durst’s lawyers complained about Pirro’s “grandstanding” and asked the judge to issue a gag order barring anyone involved from discussing the case publicly. The judge complied, and Pirro was the only person mentioned by name in the gag order, according to the New York Times. In 2015, Pirro wrote a book about her involvement in the Durst case, but her co-author, the journalist Lisa DePaulo, alleged in a lawsuit that Pirro had asked her to make up facts about the case. Pirro responded in an affidavit that DePaulo was a pill-addled alcoholic. DePaulo denied the allegations, and the two engaged in a wide-ranging dispute that included a disagreement over whose dog was defecating inside the house they had shared. In pre-trial testimony in Durst’s latest trial in April, DePaulo asserted that Pirro had carried on a years-long relationship with one of the Texas investigators on the case. After Pirro left the district attorney’s office in 2005 to run for statewide office, allegations of misconduct by her office followed her. In one case, the Second Circuit Court of Appeals threw out a high-profile murder conviction because Pirro’s office had failed to share with the defense evidence that another man had confessed to participating in the murder. State prosecutors ultimately conceded the misconduct. In 2010, on the eve of a new trial, the defendant accepted a plea deal. Pirro kicks off every episode of Justice with Judge Jeanine with a monologue that usually leads to the same point: The Clintons and the “deep state” colluded to stop Trump from winning the election, and now they have invented Russian collusion to destroy his presidency. A few minutes into her speech, a large chyron at the bottom of the screen displays the word “OPINION,” suggesting that even Fox does not want to take responsibility for what she is putting out there. Next come her guests, often Republican members of Congress, whom she badgers into taking extreme positions, such as the need to jail Clinton and top FBI officials. “Who’s going to investigate and prosecute?” she often asks. During one show in February, that question was directed at frequent guest Rep. Ron DeSantis, a Florida Republican running for governor. The previous day, House Republicans had released a memo alleging misconduct by the FBI—proof, Pirro said, that the Clintons and the FBI had conspired to defeat Trump in 2016. DeSantis said he’d push for another special counsel to investigate. “That’s not good enough,” Pirro interrupted, jabbing at the camera with a red marker. “I’m talking about cuffs. Congressman, I’m talking about handcuffs!” DeSantis kept trying in vain to get a word in, his palms face-up in supplication, as if to say, isn’t this enough? But someone was listening. In March, Sessions revealed that he had tasked a US attorney with investigating the alleged crimes of Clinton and the FBI. Soon DeSantis and 10 colleagues signed a letter asking Sessions to prosecute Clinton, former FBI Director James Comey, and other former FBI officials. Swept up in her own fervor, Pirro sometimes takes her monologues to bizarre places. A segment on abusive White House aide Rob Porter ended with a one-liner blaming Barack Obama for Trump’s hiring of Porter. A blast against a do-nothing GOP-led Congress concluded with the suggestion that conservative gun-owners might take up arms against their Republican leaders. And a screed against Comey wrapped up with the punchline that the 6’8″ former FBI director, should he ever want to wear women’s clothing, would be too tall to fit into a dress. On March 24, Pirro welcomed conservative provocateur Ann Coulter to her show. Trump had just signed a spending bill that lacked significant border wall funding. Pirro had already informed her audience that the missing money was a “total betrayal” by congressional Republicans and “not on President Trump.” But Coulter suggested that Trump had caved on the wall so he could jet off to Mar-a-Lago for the weekend. “That’s baloney,” Pirro protested. “This guy is the hardest-working guy who has ever been in that White House. He doesn’t sleep, and he works day and night.” Coulter insisted that if Trump really cared about the wall, he would fund it through Pentagon appropriations. “The fact that he signed this omnibus bill is the last straw, and this just says he never wanted to do it,” Coulter said. “Disagree,” Pirro shot back. Trump took to Twitter early the next morning. “Building a great Border Wall, with drugs (poison) and enemy combatants pouring into our Country, is all about National Defense. Build WALL through M!” he wrote, referring to the military. The following weekend, Justice with Judge Jeanine had a guest host. Pirro was at Mar-a-Lago with the president.